Accounting firms – like other professional service providers – rely heavily on client satisfaction and service quality to retain accounts and differentiate from the competition. As such, NPS can be a leading indicator of revenue retention, growth, and brand differentiation in a crowded marketplace. Net Promoter® Score (NPS) is a client satisfaction and service quality metric based on a single survey question that asks accounting clients how likely they are to recommend your firm to a friend or colleague. Clients respond using a numeric scale of 0-10, ten being extremely likely and zero being not likely at all. NPS is calculated by subtracting the % of detractors (those who respond with a 6 or lower) from the % of promoters (those who respond with 9 or 10). Click here for a more detailed look at the NPS methodology. NPS is unique because it offers standardized measurement and reporting on client satisfaction and service quality that can be applied across the accounting industry as a whole, at the firm-level, within specific practice areas, by partner, even by client category. Accounting firm NPS is a target topic for ClearlyRated’s annual industry benchmark study, and in 2019 accounting clients reported an NPS of 24% based on overall satisfaction with their firm (our sample focused on accounting clients in the U.S. and Canada). 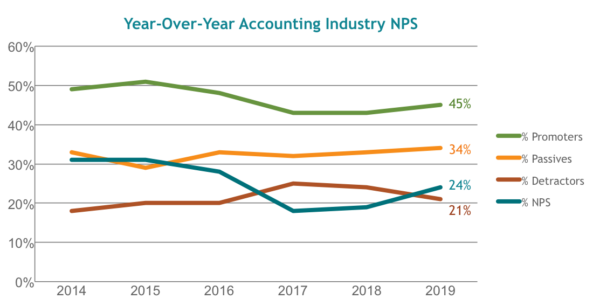 YOY data shows that accounting NPS has increased after dipping from a high point 2015. This re-stabilization is promising, as the % of self-identified detractors dropped by 3 points from 2018 to 2019. For reference, global NPS standards classify 50% NPS as excellent and 70% NPS as world-class. And recognizable service leaders like Nordstrom have an NPS of 75% compared to Comcast, a notorious service laggard, whose clients give them a -1% NPS. Click here to learn more about the NPS methodology. At 24% NPS, the accounting industry benchmark for client satisfaction and service quality is average (at best), which means that accounting firms have a unique opportunity to stand apart from the industry by investing in client satisfaction and service quality. If you’re not already leveraging NPS at your firm, we hope you consider this article a call-to-action. Not only do client satisfaction and service quality represent opportunities to differentiate in an increasingly commodified service industry, they are fuel for firm growth. And if “you can’t manage what you don’t measure” – then you certainly won’t be able to improve it either. Ready to get started with NPS? Contact the ClearlyRated team for insights, best practices, and a tour of our survey platform (designed specifically to support professional services firms). Considering a survey program? Our veteran team of survey experts has compiled a Satisfaction Survey Checklist for Accounting Firms to help you avoid common pitfalls and build a roadmap for a successful client survey initiative.